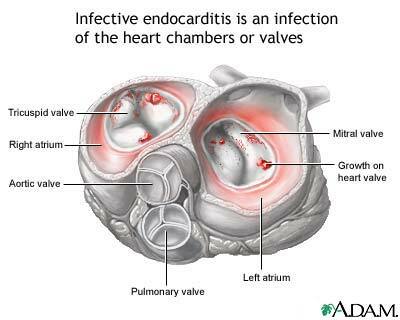 Infectious endocarditis involves the heart valves and is most commonly found in people who have underlying heart disease. Sources of the infection may be transient bacteremia, which is common during dental, upper respiratory, urologic, and lower gastrointestinal diagnostic and surgical procedures. The infection can cause growths on the heart valves, the lining of the heart, or the lining of the blood vessels. These growths may be dislodged and send clots to the brain, lungs, kidneys, or spleen. Updated by: Daniel Levy, MD, Infectious Disease, Maryland Family Care, Lutherville, MD. Review provided by VeriMed Healthcare Network. Also reviewed by David Zieve, MD, MHA, Medical Director, A.D.A.M., Inc.